There are many iconic ships in the Star Trek universe. 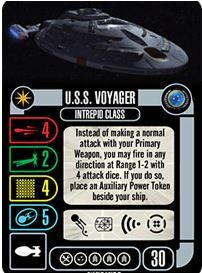 While most of us know of the Enterprise (or, at least, one variant or so of the Enterprise, depending on how many different series/movies you've watched), there's also the U.S.S. Voyager. There's one version of the ship already available, but with all the changes that happened during the run of the show, a single version of the ship is hardly sufficient. So they're coming out with another. The Voyager is all about getting the most bang for your buck when you activate the ship. An enemy not in your firing arc? No big deal, if you don't mind an Auxiliary Power token on your ship. Want some extra tokens on your ship? Janeway can do do that. Lots of other upgrades can give you various bonuses, but at the cost of disabling them. Then there's the Doctor, that can remove all those tokens with an Action. Get out there and get your ship into the thick of things. The Voyager is used to having to be self-reliant, so when part of a fleet, it can really make a lot of good things happen.